Student loans are essential for millions of American students. The reality is that many colleges charge more than students can afford, even taking into account federal, state and institutional grants. But many experts (not to mention borrowers) see many flaws in the system. They worry that too many students are borrowing more than is wise, that many students don’t understand their obligations, are ignorant of the differences between federal and private loans, and that default rates remain too high at some institutions. As a result of these concerns, government officials and educators are debating how to improve the student loan system. This webinar will explore some of the new data and some of the new ideas about student loans and student debt. Join Inside Higher Ed editors Scott Jaschik and Doug Lederman for a lively discussion on these issues in this free webinar. 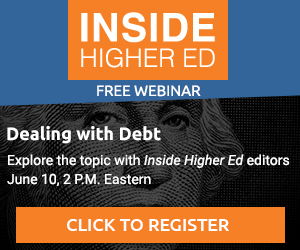 Before viewing the webinar, we invite you to download our free booklet, Dealing with Debt, a compilation of articles and opinion essays from Inside Higher Ed offering a range of ideas and perspectives, at www.insidehighered.com/booklets . Click here  to download the accompanying slide deck for this webinar. Inside Higher Ed's Dealing with Debt webinar is made possible with the support of Inceptia .